I love going to my parents house because I get spoiled by them. In fact, Lily does, too. Every meal was prepared for me and it was a huge, huge bonus that they were healthy. Avocado and a small slice of banana to go with my crock pot steal cut oats and chicken sausage? Don’t mind if I do! And dishes? None of those – my dad volunteers. My dad cleaned my wedding ring. I got to sleep in both days. And by “sleep in” I mean no alarm, but I was still up for 8am spin class on Saturday. It was an added bonus that Lily made it through the night without having to go out. The zero degree weather is always enough to disrupt even the most perfect zombie-like sleep walks. My mom ran errands with me…happily. Any person willing to go to Trader Joe’s and the grocery store with you on a weekend is a saint. I may like to cook, but good lord do I hate grocery shopping. As for Lily, well…she made her way into the recliner with me several times. It was an uncomfortable squeeze, for sure. She also held down her appointed chair and spent a large portion of the weekend sound asleep. When she wasn’t asleep, she was enjoying one of the new toys or treats she had received on the trip to Chicago. The weekend wrapped up perfectly with an Illini win (finally! ), a great run, and no traffic getting home. Win-win-win. It’s weekends like these — slow and relaxing, yet productive in their own little ways, that make Mondays and full work weeks ahead all the more daunting. Torturous, really. 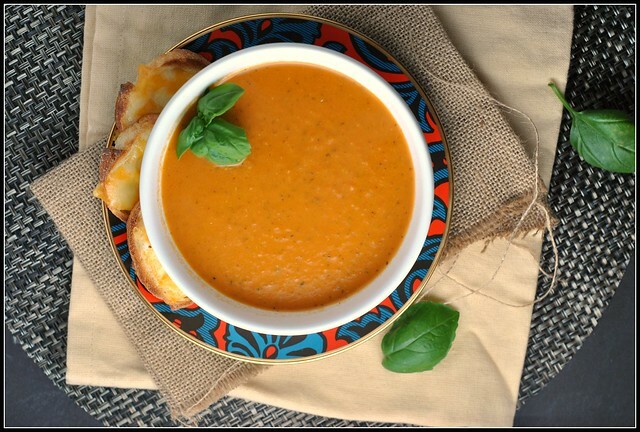 But here’s a win to start off your week: Roasted Tomato Soup with Goat Cheese. 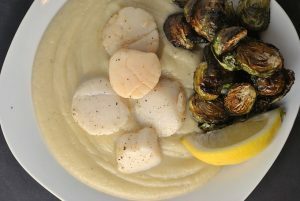 I thought this recipe would be solid, but I wasn’t quite expecting to fall head over heels in love with it. I upped the amount of goat cheese just a bit (I’m obsessed) and this soup was knock-your-socks-off delicious. Next time, I'm doubling this recipe. 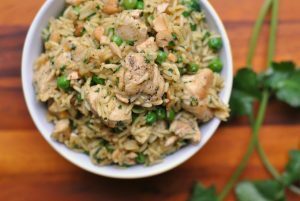 This is a great recipe with outstanding flavor! Drain the tomatoes, reserving the liquid. Cut the tomatoes in half lengthwise and place in a roasting pan. Drizzle with 1½ tablespoons olive oil; sprinkle with brown sugar, salt, and pepper. Slice the top off the head of garlic and arrange on top of a sheet of foil. Drizzle with remaining ½ tablespoon olive oil and loosely close the foil around the head of garlic; place on the roasting pan with the tomatoes. Roast for 45 minutes. When tomatoes are nearly through roasting, melt the butter in a large pot over medium heat. Once hot, add the onion and carrot; cook until soft – about 10 minutes. Add the tomatoes and 4-5 garlic cloves (or more or less to preference). Stir in the broth, basil, and reserved tomato juice; bring to a simmer and simmer for 5 minutes. Puree, either with an immersion blender or by transferring to a traditional blender. Stir in goat cheese and allow to melt completely. Serve hot. This soup looks amazing. 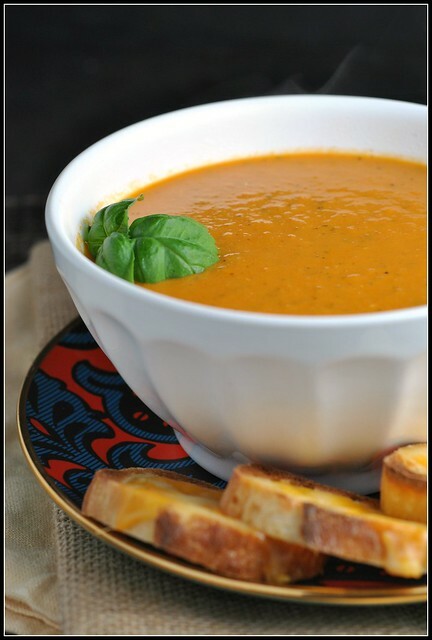 My hubby loves tomato soup and I’m certain he’d love this! PINNING! Hi Maggie, thanks for catching that typo. Sometimes my fingers are faster than my brain but I most definitely meant to say vegetable broth and corrected the error. Thanks! 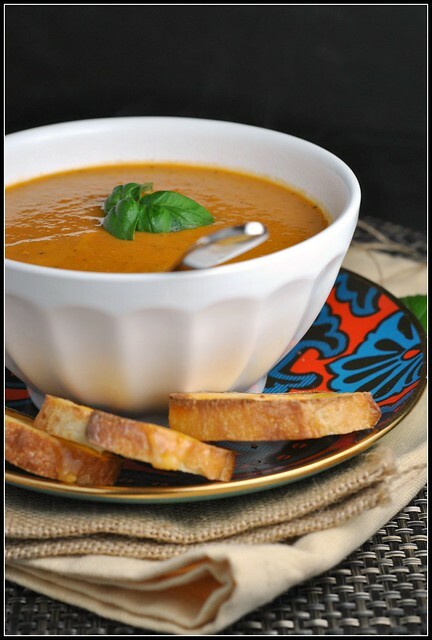 you had me at goat cheese and tomato soup! I love that you added goat cheese. 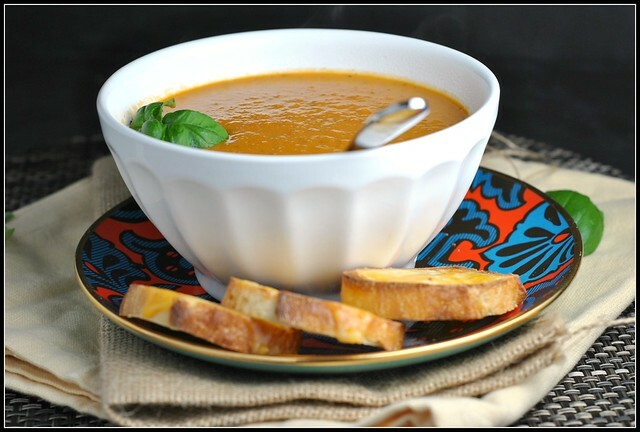 What a great way to make tomato soup even better. The restaurant that I work at makes a tomato basil bisque with blue cheese and its amazeballs – just an added kick to the soup – so good! But goat cheese rules too!